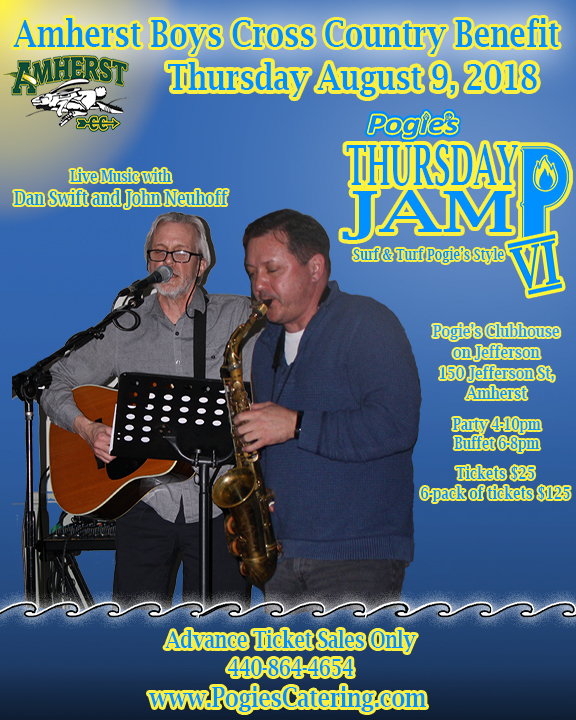 We’re back at Pogie’s Clubhouse on Jefferson for Thursday JAM VI: A Fundraiser for Amherst Boys Cross Country, on Thursday night, August 9th. 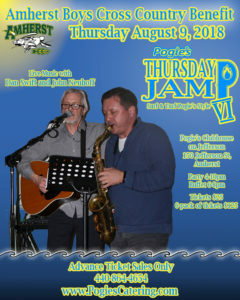 The surf and turf will sizzle on the grill as Dan Swift and John Neuhoff play the classics at Pogie’s Thursday JAM VI. Tickets are available HERE or by calling 440-864-4654. The grill will be extra hot August 9th as we cook up our favorites from the land and sea. We’re doing surf and turf, Pogie’s style with tender flame grilled steak, juicy bone-in chicken, and jumbo grilled shrimp. That’s just part of the buffet, so come early for and don’t forget to stick around for dessert. Pogie’s surf and turf will be sure to please at Pogie’s Thursday JAM VI. We want to know. Are you competitive? Do you have what it takes? Do you think to yourself, “these other people have had one too many, I’m bound to win!” Then sign up for Pogie’s Whiffle Ball Home Run Derby! The tournament will start right after dinner on Thursday night August 9th. The party starts at 4 pm, Thursday night August 9th. The dinner buffet will be up from 6-8 pm. After dinner, the live music plays until 9pm. Tickets are advance purchase only and are $25. Bring a group and get a 6-pack of tickets for $125. Pogie’s Thursday Jam, as with all events at The Clubhouse, will be B.Y.O.B, so don’t forget to bring a stocked cooler. Thursday JAM VI: A Fundraiser for Amherst Boys Cross Country Facebook Page!